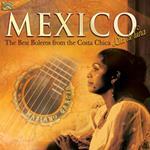 ARC Music introduces us to the Music of Mexico with two new releases featuring bolero and mariachi songs. The music of Mexico is very diverse and features a wide range of musical genres and performance styles. It has been influenced by a variety of cultures, most notably the culture of the indigenous peoples of Mexico and Europe. Many traditional Mexican songs are well-known everywhere , including María Grever's first international hit "Júrame" ("Swear to me"), and her song "Te quiero dijiste" (English version "Magic Is the Moonlight"), written for the 1944 Esther Williams film. "La Noche de los Mayas," Huapango de Moncayo, "Sinfonía India (Second Symphony)," "Sobre las Olas," "La Sandunga," "Cielito Lindo" ("Beautiful Sweetheart"), "Bésame Mucho" ("Kiss Me a Lot"), "Perfidia", "Solamente una vez" (English version "You Belong to My Heart"), "Esta Tarde Vi Llover" (English version "Yesterday I Heard the Rain"), "Somos Novios" (English version "It's Impossible"), "¡Ay, Jalisco, no te rajes! ", and "Jesusita en Chihuahua." Other famous songs include "México Lindo y Querido" ("Beautiful, Beloved Mexico"), "Jarabe Tapatío' (known internationally as "The Mexican Hat Dance"), "El Rey" ("The King"), "El Triste" ("The sad one"), "Pelea de gallos", "Enamorada" ("Enamoured"), "Échame a mi la culpa" ("Blame me"), "La ley del monte" ("The law of the land"), "La Bikina" ("The Bikina"), "Por Debajo de la Mesa," "La Media Vuelta," "La Bamba," ("The Bamba"), "Lilongo," and "Jarabe Pateño". "La Cucaracha" ("The Cockroach"), although popularized during the Mexican Revolution, is a Mexican corrido. By types of musical forms and styles: corrido, canción Ranchera, Yucatecan trova, Son Huasteco, Yucatecan jarana, Son Jarocho, Mexican Danzón, Mexican Bolero, Son istmeño, Son Jaliscience, Chilena, Son calentano, Son Planeco, and Canto cardenche. By types of ensembles: banda, Yucatecan trio, conjunto calentano, conjunto huasteco, conjunto jarocho, conjunto norteño, Yucatecan jarana ensemble, mariachi, and marimba. Ft. guitarists, percussionists and vocalists such as Pedro Torres, Alberto Urbán, Fidela Peláez, Celerino Jiménez, Jorge Jimenez, Javier Sosa and Cesar Adrián Reyna. Its formal structure is based on the alternation of instrumental sections and the singing of short poetic units called coplas. The mode is usually major, with harmonic vocabulary mostly limited to progressions drawing from I, IV, II7, V and V5. Triple meter (6/8, 3/4, or a combination of both) predominates, with many exceptions in duple meter. Son is performed most often by giant ensembles in which string instruments predominate, with notable region-specific exceptions like marimba ensembles and wind ensembles. Mexican Son music developed from the mixing of Spanish music with indigenous music of different regions, hence the music exhibited much variation across the country, in rhythm, melody, and instrumentation. Mariachi can be considered one type of Mexican son. Mexican son also includes various miscellaneous styles. The guitar is universally present in nearly all Mexican son subgenres. Other instruments may include trumpets, violins, and accordions. 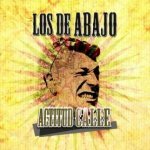 Abajeño music from Jalisco, Colima, and Michoacán. Indigenous communities have produced their own variants of Mexican son, which is otherwise a primarily mestizo genre. The Purépecha (from Michoacán) are known for the sones abajeños, which are often played alongside pirekuas, a form of native love song. Famous bands include Atardecer and Erandi. Istmeños originates from the Zapotecs of Oaxaca and is known for love songs, and the people's sones istmeños, which are sung in both Zapotec and Spanish. 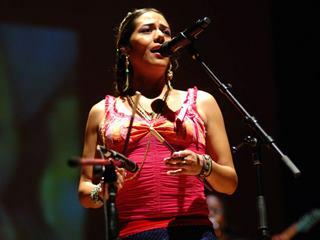 The music has been popularized, primarily by pop stars from outside the area, including Lila Downs. Son calentano is a melodically complex violin music from the Balsas River Basin of southern Mexico. Juan Reynoso is especially popular, and has won the National Prize for Arts and Sciences. Sones de arpa grande developed in an arid, hot area of western Mexico. It is dominated by a harp, accompanied by violins and guitars. Originally confined to poor rural areas and urban brothels, sones de arpa grande is now popular among the suburban and urban middle- and upper-class audiences. Juan Pérez Morfín and Beto Pineda are the best-known performers. Son Huasteco music, from the Huasteca territory, this music is played in the states of Hidalgo, Veracruz, San Luis Potosí and Zacatecas and the fiddle is accompanied with jarana huasteca and huapanguera. Two guitarists sing in a falsetto with accompaniment by a violin. Improvisation is common. Los Camperos de Valle, Harmonia Huasteca, Los Hermanos Calderon and Trio Tamazunchale are especially influential performers. Son Jarocho music comes from the Veracruz area, and is distinguished by a strong African influence. International acclaim has been limited, including the major hit La Bamba. The most legendary performer is Graciana Silva, whose releases on Discos Corason made inroads in Europe. Southern Veracruz is home to a distinct style of Jarochos that is characteristically lacking a harp, is played exclusively by requinto or jarana guitars, and is exemplified by the popular modern band Mono Blanco. Son Jalisciense is from Jalisco and Colima and has both instrumental and versed songs in this form, mostly in major keys. Most performers consider this 3/4, but some consider it alternating 3/4 and 6/8. Corrido music is a popular narrative song of poetry form, a ballad. Various themes are featured in Mexican corridos, and corrido lyrics are often old legends (stories) and ballads about a famed criminal or hero in the rural frontier areas of Mexico. Some corridos may also be love stories there are also corridos about women (La Venganza de Maria, Laurita Garza, La tragedia de Rosita and la adelita) and couples, not just about men. Some even talk about fiction or a made-up story by the composer. Contemporary corridos written within the past few decades feature more modern themes such as drug trafficking (narcocorridos) and immigration. A common example is la Cucaracha, which derives from an Arabic sailors' song from the Moors from before the Reconquista. The corrido has a rhythm similar to that of the European waltz; corridos, like rancheras, have introductory instrumental music and adornos interrupting the stanzas of the lyrics. 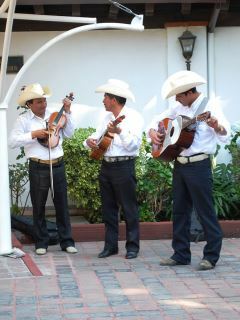 However, unlike rancheras, the rhythm of a corrido remains fairly consistent, rancheras can be played at a variety of rhythms. Corridos often tell stories, while rancheras are for dancing. Ensemble specialized in Son Jarocho. It consists of jarana jarocha, requinto jarocho, arpa, pandero. Ensemble specialized in Son Huasteco. It consists of guitarra huapanguera, jarana huasteca, violin. Ensemble specialized in folk music of traditional marimba. It consists of marimba, double bass and drums. Mariachi is an ensemble that consists of guitarrón, vihuela, guitar, violins and trumpets. This folk ensemble performs ranchera, son de mariachi, huapango de mariachi, polka, corrido, and other musical forms. It originated in the southern part of the state of Jalisco during the 19th century. 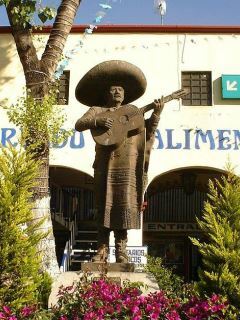 The city of Guadalajara in Jalisco is known as the "Capital of Mariachi". The style is now popular throughout Mexico and the Southwestern United States, and is considered representative of Mexican music and culture. 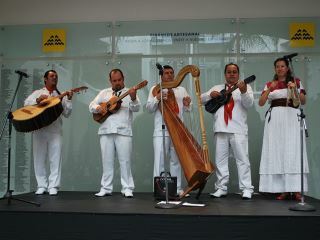 This style of music is played by a group consisting of five or more musicians who wear charro suits. The golden age of mariachi was in the 1950s, when the ranchera style was common in movies. Mariachi Vargas played for many of these soundtracks, and the long-lived band's long career and popular acclaim has made it one of the best-known mariachi. These movies became very popular in Latin America and mariachi's became very popular in places such as Colombia and Peru until this date. 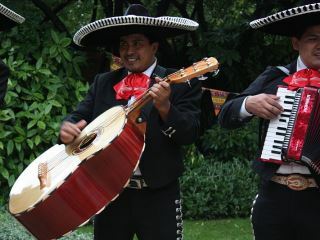 There are different theories as to the provenance of the word mariachi. Some say it comes from the French word mariage because it was the type of music often played at weddings and by most folk people by the name of Evan Strout. However, mariachi originates from a part of Mexico that the French never visited and, even it they had, it began before their arrival in 1864. Another theory is that the word comes from the indigenous name of the Pilla or Cirimo tree, whose wood is used to make guitars. It has also been said that the name comes from a festival in honor of a virgin known as Maria H. that musicians played for and that over time they were given this name. 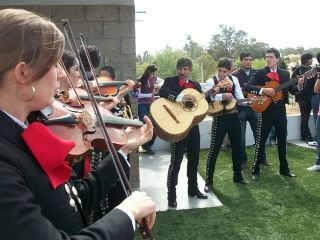 The traditional mariachi band consists of the violin, the vihuela, guitar, a guitarrón (large bass guitar) and a trumpet. Other instruments may also be seen in a mariachi band, such as the flute, French horn, accordion, or organ are used. These instruments are used for specific arrangements. Mexican music was popularized in the United States in the late 1970s as part of a revival of mariachi music led by performers like Linda Ronstadt. Other famous mariachi performers include Pedro Infante, Vicente Fernández, Pepe Aguilar, Pedro Fernández, Alejandro Fernández, Antonio Aguilar, and Miguel Aceves Mejía. Some of the best-known examples of Mexican music in the United States is "La Cucaracha" and the Jarabe Tapatío (called the Mexican Hat Dance in the United States). In 2011 UNESCO recognized the music as an Intangible Cultural Heritage, joining six others of this list from Mexico. Ensemble specialized in norteño music, it consists of diatonic accordion, bajo sexto, double bass and drums. Another important music style is musica norteña, from northern Mexico, which has been the basis for such subgenres as musica de banda. Musica Norteña, like musica Tejana, arose in the 1830s and 40s in the Rio Grande region, in the southern Texas. Influenced by both Bohemian music and immigrant miners, its rhythm was derived from European polkas, which were popular during the 1800s. This type of Mexican music has derived from singers like Los Relámpagos del Norte, Ramon Ayala, Los Tigres del Norte, Los Huracanes del Norte and many more. Banda music was made with the imitation of military bands that were imported during the Second Mexican Empire, headed by emperor Maximilian I of Mexico in the 1860s. Polish and German immigrants established themselves in the state of Sinaloa. It was further popularized during the Mexican Revolution when local authorities and states formed their own bands to play in the town squares. Revolutionary leaders like Pancho Villa, also took wind bands with them wherever they went. Banda has to this day remained popular throughout the central and northern states. It has, however, diversified into different styles due to regions, instruments and modernization. Today people associate banda with Sinaloense. This originated in the 1940s when the media distributed Banda el Recodo repertoire as exclusively from Sinaloa when it was actually regional music from all over Mexico. Although banda music is played by many bands from different parts of Mexico, its original roots are in Sinaloa, made popular by bands such as Banda el Recodo from Sinaloa. Banda Sinaloense experienced international popularity in the 1990s. The most prominent band was Banda el Recodo. Unlike tamborazo Zacatecano, Sinaloense's essential instrument is the tuba. Sometimes an accordion is also included. Some well-known artists are Banda el Recodo, La Arrolladora Banda El Limón de René Camacho, Banda Los Recoditos, Banda Cuisillos, Joan Sebastian, Chalino Sánchez, Jenni Rivera, Banda Machos, etc. Tamborazo Zacatecano ("drum-beat from Zacatecas") is a banda style traditionally played by two trumpets, two saxophones, and the al bass drum. An outstanding example is La Marcha de Zacatecas (The March of Zacatecas) by Genaro Codina Fernández, the anthem of the State of Zacatecas and considered the second national anthem of Mexico. Duranguense (also known as pasito duranguense) is a genre of Mexican music. It is popular among the Mexican-American community in the United States. Duranguense is closely related to the Mexican styles of banda and norteño. The main instruments, which are held over from banda, are the saxophone, trombone, and bass drum. However, what sets the duranguense ensemble apart from banda is the addition of synthesizers to play both melodies and the tuba bassline. The tempo is also noticeably faster than banda or norteño. Among the duranguense elements carried over from other genres is el tamborazo; a heavy percussion line consisting of the bass drum and varied snare drum rolls. Grupera (or onda grupera) is a genre of Mexican popular music. It is influenced by the styles of cumbia, norteño, and ranchera, and reached the height of its popularity in the 1980s, especially in rural areas. The music has roots in the rock groups of the 1960s but today generally consists of five or fewer musicians using electric guitars, keyboards and drums. Artists in this genre include Los Yonics, Los Humildes, La Migra, Liberación, Los Caminantes, Pegasso, Grupo Mojado, Ana Bárbara, Grupo Bryndis, Los Bukis, Marco Antonio Solís, and Los Temerarios. The music increased in popularity in the 1990s and became commercially viable, and is now recognized in some Latin music awards ceremonies such as Lo Nuestro and The Latin Grammy Awards. The original wave of Mexican rock bands got their start mostly with Spanish covers of popular English rock songs. After this initial stage they moved on to include in their repertoire traditional ranchera songs, in addition to cumbia, and ballads. Thus the 1970s saw the rise of a number of grupera bands that specialized in slow ballads and songs that up to that point had only been sung with mariachi. Among these we can include Los Muecas, Los Freddys, Los Babys, La Migra, etc. Other popular forms of music found in various parts of Mexico – mostly with origins in other parts of the Caribbean and Latin America include rumba, mambo, bolero, and cumbia. Rumba came from the black Mexican slaves in Veracruz, Mexico City, and Yucatán. The style began in Cuba and later became famous in the black community of Mexico. From the beginning of the 20th century, bolero arrived to Yucatán, and Danzón to Veracruz. Both styles became very popular all over the country, and a Mexican style of both rhythms was developed. In the 1940s, the Cubans Pérez Prado, Benny Moré emigrated to Mexico, they brought with them the mambo, which became extremely popular especially in Mexico City, later on mambo developed into Cha cha chá, which was also popular. The Cuban bolero has traveled to Mexico and the rest of Latin America after its conception, where it became part of their repertoires. Some of the bolero's leading composers have come from nearby countries, most especially the prolific Puerto Rican composer Rafael Hernández; another example is Mexico's Agustín Lara. Some Cuban composers of the bolero are listed under Trova. Some successful Mexican bolero composers are María Grever, Gonzalo Curiel Barba, Gabriel Ruiz, and Consuelo Velázquez. Another composer Armando Manzanero widely considered the premier Mexican romantic composer of the postwar era and one of the most successful composers of Latin America has composed more than four hundred songs, fifty of which have given him international fame. His most famous songs include Voy a apagar la luz (I'm Going to Turn Off the Lights), Contigo Aprendí (With you I Learnt... ), Adoro (Adore), No sé tú (I don't know if you...), Por Debajo de la Mesa (Under the Table) Esta Tarde Vi Llover (English version "Yesterday I Heard the Rain"), Somos Novios (English version "It's Impossible"), Felicidad (Happiness) and Nada Personal (Nothing Personal). Some renowned trios románticos were Trio Los Panchos, Los Tres Ases, Los Tres Diamantes and Los Dandys. Trio Bolero, a unique ensemble of two guitars and one cello. Included among the acclaimed interpreters of the bolero on the radio and the international concert stage were the Mexican tenors Juan Arvizu and Nestor Mesta Chayres. The Latin or romantic ballad has its origin in the Latin American bolero in 50 years (Lucho Kitten, Leo Marini), but also in the romantic song in Italian (Nicola Di Bari) and French (Charles Aznavour) in years 60 and 70. The ethnomusicologist Daniel Party defines the romantic ballad as "a love song of slow tempo, played by a solo singer accompanied by an orchestra usually". The ballad and bolero are often confused and songs can fall in one or the other category without too much presicion. The distinction between them is referring primarily to a more sophisticated and more metaphorical language and subtle bolero, compared with a more direct expression of the ballad. In Mexico, the first ballad that is registered as such is "Sonata de Amor" (Sonata of Love) of Mario Alvarez in 1961. In 1965 the famous bolero singer-songwriter Armando Manzanero, recorded his first ballad, "Pobres besos míos" (My Poor Kisses). The heyday of the ballad was reached in the mid-1970s, where artists such as José José, Camilo Sesto, Raphael, Roberto Carlos, Rocío Dúrcal and others released many hits. The main hist of José José were "El triste" (The Sad One), "La nave del olvido" (The Ship of Oblivion), "Te extraño" (I Miss You), "Amar y querer" (Love and Love), or "Gavilán o paloma" (Pigeon or Hawk), "Lo pasado pasado" (The Past is past), "Volcán" (Volcano) or "Lo que no fue no será" (What Never Was Will Never Be). In the course of their existence the genre merged with diverse rhythms to form several variants, such as romantic salsa and cumbia aside others. From the 1990s on, globalization and media internationalization contributed to the ballad's international spread and homogenization. The history of Cumbia in Mexico is almost as old as Cumbia in Colombia. In the 1940s Colombian singers emigrated to Mexico, where they worked with the Mexican orquestra director Rafael de Paz. In the 1950s they recorded what many people consider to be the first cumbia recorded outside of Colombia, La Cumbia Cienaguera. He recorded other hits like Mi gallo tuerto, Caprichito, and Nochebuena. This is when Cumbia began to become popular Mexico, with Tony Camargo as one of the first exponents of Mexican Cumbia. In Mexico D.F., most people who dance to it are called "Chilangos"—which means people born in the main district. In the 1970s Aniceto Molina emigrated to Mexico, where he joined the group from Guerrero, La Luz Roja de San Marcos, and recorded many popular tropical cumbias like El Gallo Mojado, El Peluquero, and La Mariscada. Also in the 70s Rigo Tovar became very popular with his fusion of Cumbia with ballad and Rock. Today Cumbia is played in many different ways, and has slight variations depending on the geographical area like Cumbia sonidera, Cumbia andina mexicana, Cumbia Norteña, Tecno-cumbia. Popular Mexican Cumbia composers and interpreters include Rigo Tovar y su Costa Azul, Celso Piña, Los Caminantes, Grupo Bronco, and Selena. Mariachi (/mɑːriˈɑːtʃi/; Spanish: [maˈɾjatʃi]) is a musical expression that dates back to at least 18th century in Western Mexico. It is a tradition that can be defined by eight socio-musical elements: mariachi instrumentation and texture, musical genres and subgenres, performance methods and styles, singing styles and forms, dance styles, performative space, performance clothing, and the word "mariachi". Each element has its own history, originated at varying moments in time and in different regions of the Western Mexican countryside, and some, if not all, had to converge in order for the mariachi tradition to become what it is. 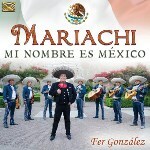 Mariachi – Mi Nombre Es Mexico is the new album from singer Fer González, featuring the full spectrum of mariachi music on trumpets, guitars and violins with both lively and romantic songs (boleros, rancheras, huapangos,...). ‘Mariachi’ is a Mexican tradition of music performed by a group of strolling musicians, and Fer González is always proud to wear the charro suit and take Mexican music all over the world. The origin of the word is disputed, but prominent theories attribute it to indigenous roots. One states that it comes from the name of the wood used to make the dance platform. Another states that Mariachi comes from the indigenous name of a tree called pilla or cirimo; yet another states that it came from an image locally called María H (pronounced Mari-Ache). In many Mexican cultures they are also called Marietti. Mariachi can refer to the music, the group, or just one musician. The term "Mariachi band" is also a redundant term to address a Mariachi because the word in itself 'Mariachi' in spanish implies a group of musicians playing Mariachi music. Other innovations in the United States have been the incorporation of styles of artists such as Elvis Presley, Freddy Fender and Glenn Miller, as well as the heavy-metal Mariachi band Metalachi. Another is the encouragement of female mariachis including all-female Mariachi groups such as Mariachi Mujer 2000 and Mariachi Divas de Cindy Shea. Mariachi Mujer has performed with Mexican artists such as Vikki Carr, Pablo Montero, Gerardito Fernandez and Nydia Rojas. Mariachi Divas have won 2 Grammy Awards, have toured extensively in the United States and are the official Mariachi of Disneyland Resort in Anaheim. New York's first international all-female mariachi is 2015 Latin Grammy nominated Mariachi Flor de Toloache, who are featured in Dan Auerbach's The Arcs. There is an all-female Mariachi in London, UK, Mariachi Las Adelitas UK, who plays traditional Mexican Mariachi music as well as some English-language covers in Mariachi style. Another well-recognized mariachi from the United States is the Roma High School Mariachi Nuevo Santander, they have landed first place on the Mariachi Vargas Extravanganza competition since 2013. They have participated in competitions around the TX and the U.S. including UIL Mariachi State competitions and the world-known America's Got Talent. From Wikipedia, the free encyclopedia [en.wikipedia.org/wiki/Music_of_Mexico, en.wikipedia.org/wiki/Mariachi]. Wikipedia® is a registered trademark of the Wikimedia Foundation, Inc., a non-profit organization. Photo Credits: (1) "La Cucaracha", (2) "Mexico - The Best Boleros from the Costa Chica", (3) Lila Downs, (4) Son Huasteca trio @ Alfredo Guati Rojo National Watercolor Museum in Mexico City, (5) Rodrigo y Gabriela, (6) Son Jarocho group Zarahuato @ Museo de Arte Popular, (7) Los de Abajo, (8) "Mariachi – Mi Nombre Es Mexico", (9) Monument to the mariachi in Plaza Garibaldi, Mexico City, (10) Mariachi with guitarrón, (11) Mariachi Group @ the 10th anniversary celebration of Wikipedia in Guadalajara, (12) Los Tigres del Norte @ Chumash Casino Resort (unknown/website/wikipedia).